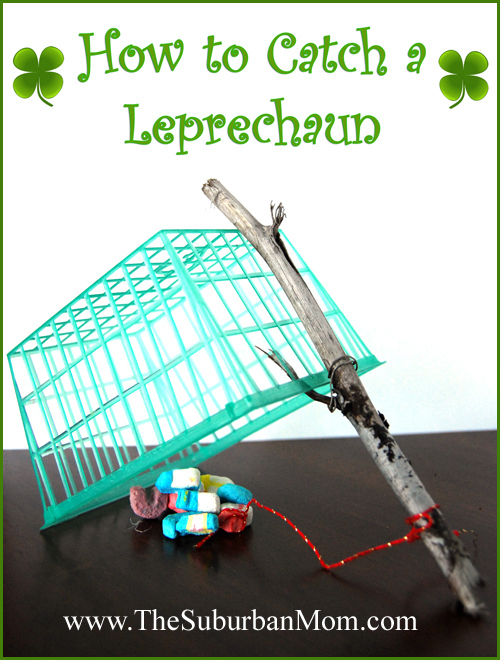 May the luck of the Irish be with you finding a leprechaun or not! A wish that every day for you will be happy from the start and may you always have good luck and a song in your heart. May good fortune be yours, may your joys never end. Okay, so Pi Day is about mathematics. Enjoy it as you may all of you engineers and mathematicians out there. You know who you are, Dave, Uncle Bob, Juan Roberto and all you others. What is it about St. Patrick’s Day and cereal? 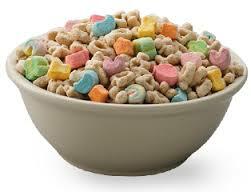 It’s time to enjoy a big bowl brimful of Lucky Charms and start crafting with Froot Loops. Last year we made special Shamrocks for our neighborhood birds. Click here for the how to share your cereal with your feathered friends. 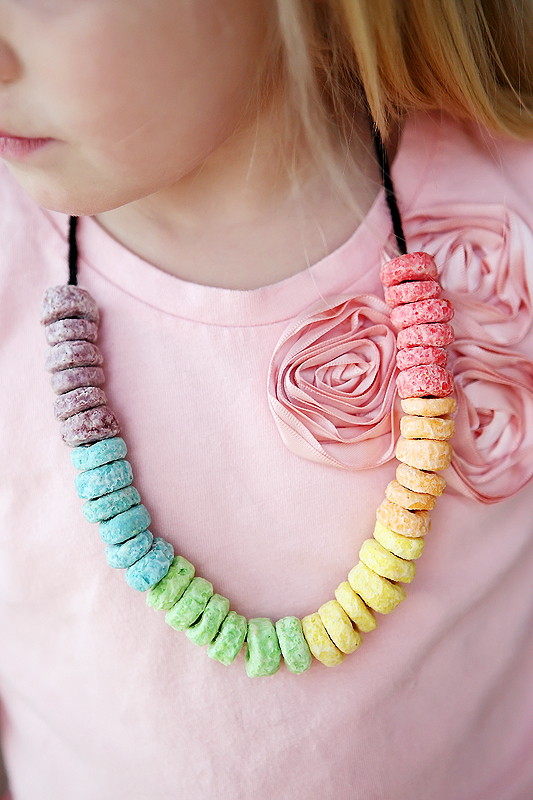 This year we are taking a clue from Eighteen25 and designing over the rainbow necklaces as pictured above. 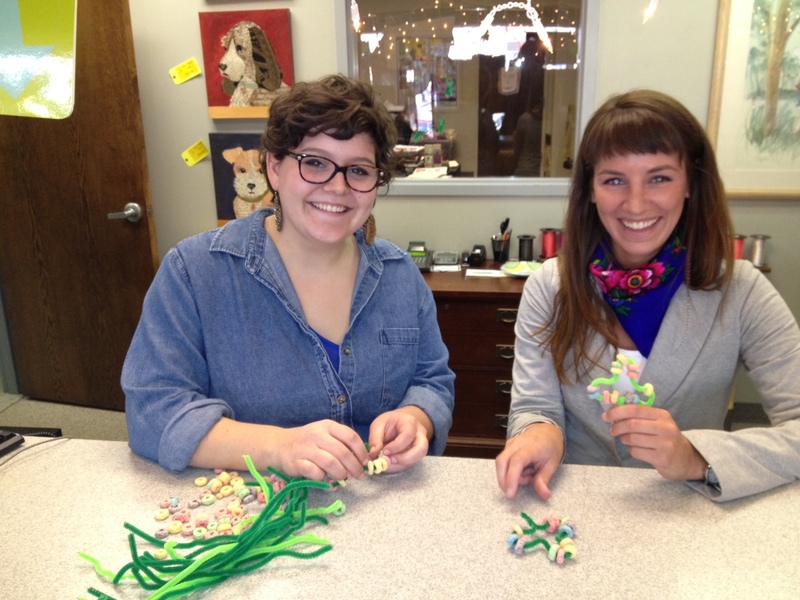 Head on over to their blog for a fruit loopy lesson in edible fashion. While searching for Spring we decided to at least bring some yummy flower blossoms into the kitchen. Just keep thinking Spring and it may happen. You can bake up these charming flower-shape cookies with the help of one simple kitchen tool – scissors! 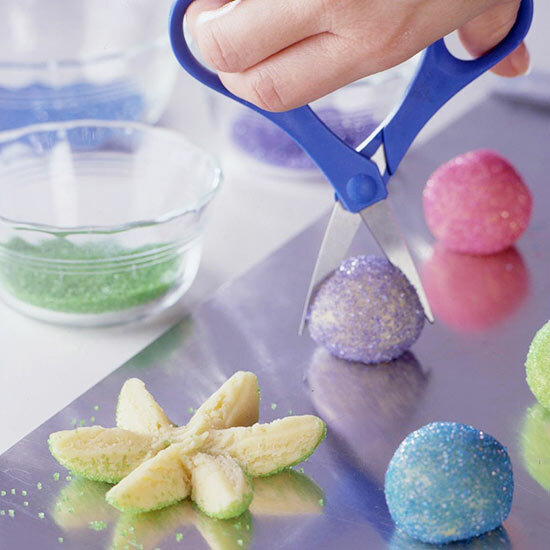 Have the kiddos roll sugar-cookie dough balls in colored sugar, then you can use a clean pair of scissors to cut each cookie ball almost in half. Cut each half into thirds, making sure not to cut all the way through. 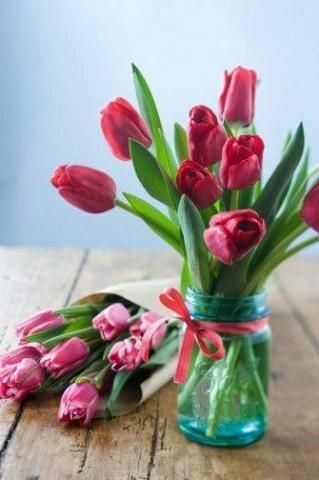 Separate the petals, place a colorful candy in the center, and voila! You will have a touch of Spring (for a short time) with adorable cookie blossoms. You can use your favorite sugar cookie recipe. We took a short cut using Pillsbury Sugar Cookie Dough and baked 8 to 10 minutes at 375°. Here in Minnesota we are hoping that there will be some “Spring ahead” for us and the sooner the better. With eight foot snow drifts and ice covered roads there is not yet a visible sign in site. Setting our clocks ahead early tomorrow morning will at least feel like the first step in looking forward to welcoming warmer weather and longer days. After an unbelievable fifty days of subzero weather so far this year, Spring can not arrive fast enough. It’s about time, literally and figuratively, to remember daylight saving (not savings) time officially begins tomorrow: Sunday, March 9, 2014 at 2 a.m. The concept of something much like DST was referenced by Benjamin Franklin in a satirical 1784 essay titled An Economical Project. The concept of something much like Daylight Saving Time was referenced by Benjamin Franklin in a satirical 1784 essay titled “An Economical Project. What’s better than a delicious edible reminder? We will be marking ours on two o’clock rather than five till midnight. Head over to Hungry Happenings to learn how to make these delicious timely clocks. On our cool kids beds search, look what we found down under! 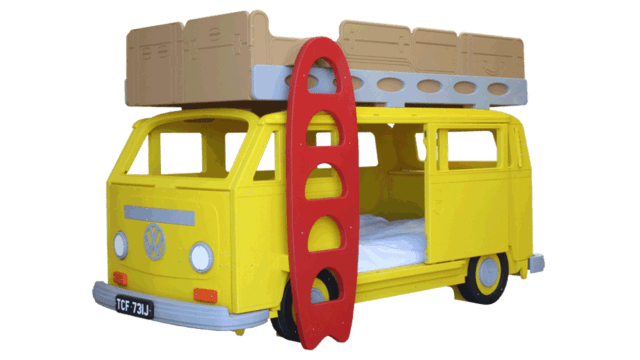 This yellow VW camper is actually a bunk bed; the winner hands down. We have a few more days in Sydney, Australia and will share our finds.